Illustration courtesy of Mark Steele, Harvard Magazine, September-October 2017. "It was so much fun. 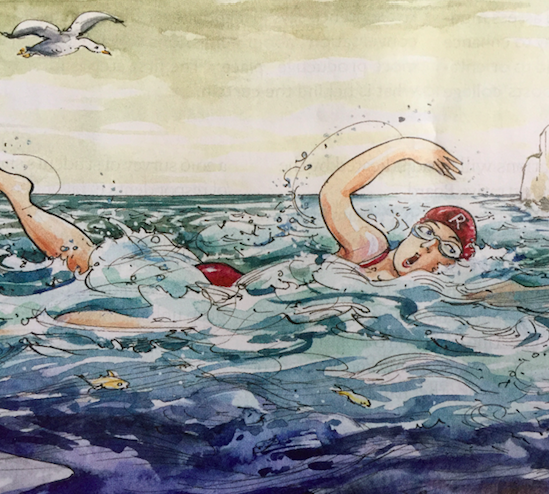 I laughed and giggled the whole way," recalled Boston College Professor Sharon Beckman about her 9 hour 6 minute crossing of the English Channel in August 1982. "[But] the last two miles took forever. I could see the coast of France, I could see the rocks in front of me, but it seemed like I wasn't getting any closer. I didn't think I'd ever get there. It was such a perfect day. I felt good the whole way. I was never tired at all. All in all, I'm really happy. It was a fund swim, so much fun that I'm kind of sad that it's over." Considering the generation, Beckman received great support en route to her Channel success. Silvergate and Gerner, the Boston law firm where the Harvard graduate was employed at the time, granted her time off to train and travel, and made a contribution to her fund-raising efforts. She also received a US$1000 grant from Radcliffe College to help with her costs.